POSTED: Sat, 12/13/2014 - 06:00 | POSTED BY: Traci C.
If you're a fan of shiny, sparkly things like Alex and Ani bangles, today's your lucky day! Several all-new Alex and Ani bracelet designs are headed to the Disney Parks just in time to add them to your holiday wish list. There's a new collection called "Words Are Powerful" and it's inspired by famous Disney sayings. One of the bracelets features a charm with 'It All Started With A Mouse' and another features the famous 'Hakuna Matata' from The Lion King. The "Words Are Powerful" bracelets are available in Shiny Silver and Yellow Gold finishes starting December 15. A dated '2015' bangle featuring Mickey Mouse is also debuting on December 15 in Rafaelian Gold and Rafaelian Silver. Guests at Walt Disney World can find these new designs at Disney Outfitters in Disney's Animal Kingdom, Bayview Gifts at the Contemporary, Keystone at Disney's Hollywood Studios, Mouse Gear at Epcot, the Emporium at the Magic Kingdom, and Tren-D and World of Disney Store in Downtown Disney. If you're visiting Disneyland the bracelets can be found at Elias & Co., New Century Jewelry, Disney Vault 28, and World of Disney Store. If you laid all my wife's Alex and Ani bracelets end to end...it would be pretty long. 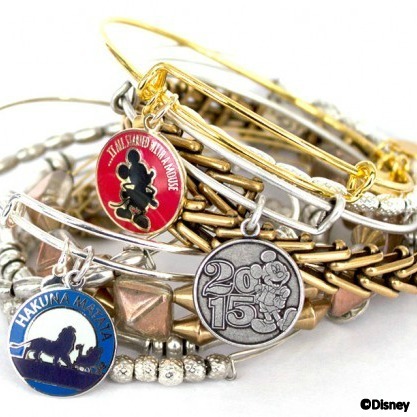 Where do you buy the disney alex and ani bracelets for not like 44-67$?? Hi Bob! There are several knock-off brands that can be found of this style bracelet, but only the actual Alex & Ani brand is official Disney merchandise. Like many designer goods, they carry a designer price tag.